Can a Team of Independent Journalists Help Prevent ISIS Recruitment in Georgia? 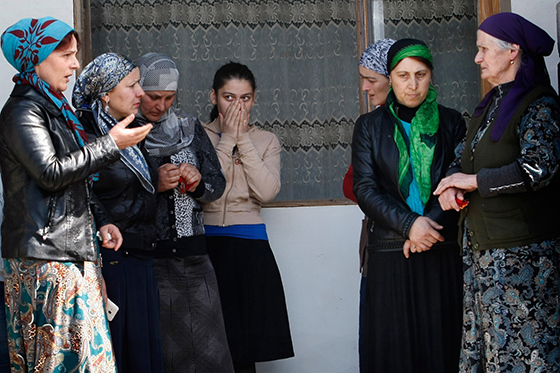 In Jokolo, a remote village in the former Soviet republic of Georgia, a loud domestic argument erupts outside the home of Vakha Tokhosashvili’s close relatives. Tokhosashvili is a 21-year-old Georgian who was recruited to fight for ISIS only months ago, and the angry people in the yard are relatives of a 17-year-old girl. The girl has been chosen as a bride for Tokhosashvili by local men, who are ready to send her to Syria. She has been receiving threatening messages from Syria warning her not to resist. Her fate seems sealed until a journalist from a local news agency appears on the scene. Before filing the story, he reports the cause of the dispute to police, who interrogate the girl and eventually return her to her parents. She survives. Jokolo is located in the beautiful Pankisi Gorge region of Georgia, two hours from the capital of Tbilisi. The area is home to a small Muslim community in a country where around 10 percent of the multiethnic population practices a traditional form of Islam not generally associated with radicalism. Life in the Pankisi community is not easy. Many locals live in extreme poverty with very little hope for a better future. The employment options for both youth and working-age adults are few. In this environment, teens and young adults are particularly susceptible to the messages spread by ISIS propaganda. The extremist group has come to view Pankisi Gorge as fertile ground for new recruits. According to official data, 50 residents of Georgia have already been recruited to Syria. But locals insist the total is actually higher. Gela Mtivlishvili, the journalist who witnessed the scene in Jokolo, believes 50 residents have been recruited from Pankisi alone. He has documented at least 13 local men who went to Syria and were killed. Mtivlishvili founded the Information Center of Kakheti (ICK), an independent media outlet in Georgia. He was the first journalist to uncover the shadowy network of youth recruitment in Pankisi. Until then, Georgian citizens had not considered ISIS a real threat to their country. Reports from this small but dedicated team of journalists have continued to generate wider coverage of this issue by both mainstream Georgian and international media. Since 2014, ICK has broken several stories about teenagers in Pankisi who left for Syria to join ISIS, and in April 2015, Mtivlishvili wrote about another 17-year-old girl sent to Syria as a bride—this time, chillingly, with her parents’ consent. Since its founding in 2010 as the first online news source of its kind in Eastern Georgia, ICK has grown from a couple hundred visitors to become the most reliable source of information about the region. It now reaches around 10,000 unique visitors a day, bringing local issues of corruption, discrimination, and social injustice to light in a nation where the internet penetration rate is 40 percent. On a number of occasions, Mtivlishvili and his peers have been rebuked by government officials for intervening in the country’s security issues and sparking groundless fears. But it’s hard to argue with the facts and the results. ICK might be the only group of journalists with whom local residents are willing to discuss the hidden stories in their community. And because of these investigative efforts, law enforcement agencies are now realizing they must respond to ISIS’s actions and influence in Pankisi Gorge. View this post on our website.